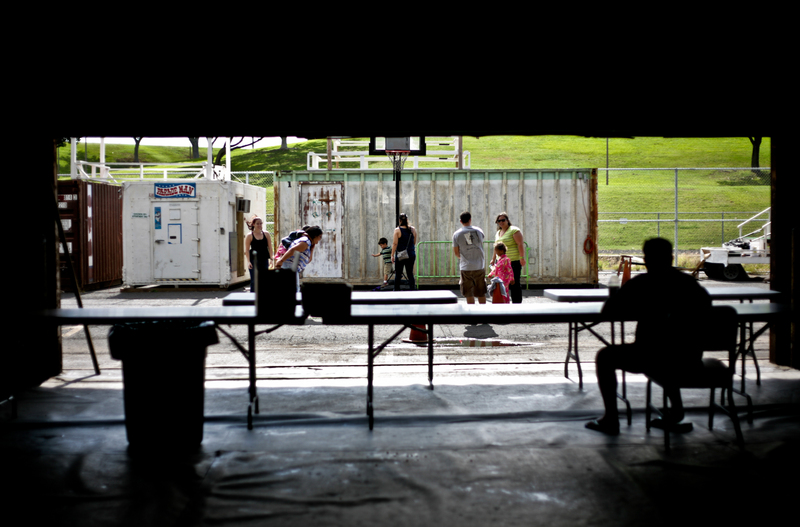 Outside play area at the homeless shelter. Nearly three years ago, my husband and I started an art workshop for children at a local homeless shelter. The Art Department at the University of Hawai`i at Manoa was generous enough to provide us with donated art supplies, and we made it a family activity to visit the shelter every Saturday. Although I am not sure where the children are today, I do hope that they had a positive experience in spending that summer with my family, friends, and student volunteers. 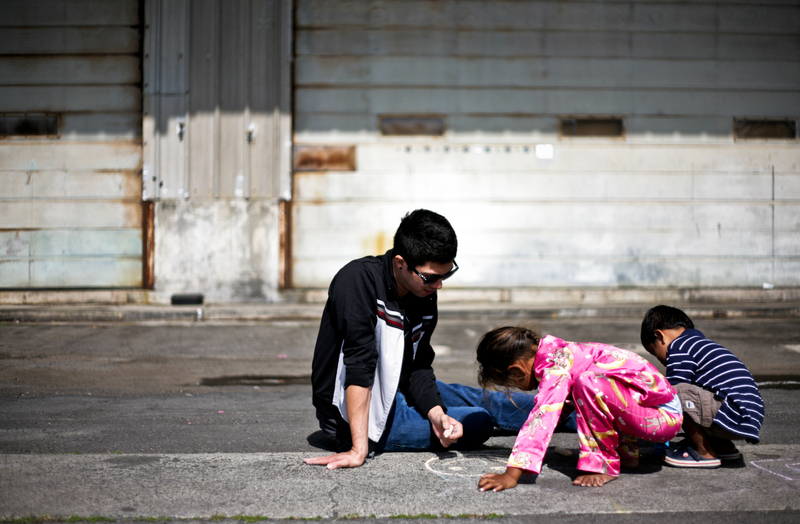 A university student helps two children draw an outline of a sidewalk chalk game. Some of my friends and family were both surprised and curious as to why we included our own children in this. I saw the value in exposing the children to other conditions, and wanted to teach them an early life lesson: People come from all different walks of life, and not all are as fortunate as we are. My children became more socially sensitive to these childrens’ circumstances, and would ask questions about the shelter and living conditions. At the time, my children were 4 and 5 years-old. I’ll never forget one of the dinner conversations we had shortly after beginning this workshop. My sons had asked why these children live in boxes, and became concerned about their day-to-day lives. I was touched by their concern. I wasn’t sure if they would understand the value of what we were trying to impart by including them in our activities. Ultimately, I think they became more patient and understanding of differences and were willing to extend help because of it. My sons went into their rooms that night and started creating a tornado of a mess. I went upstairs preparing to bark at them to clean it all up, and they quietly explained that they were giving those toys to the children at the shelter. I teared up. I think it really hit home for them when the realized that these families literally live in one cubicle no bigger than half the size of their bedroom, and had very little “extras” in their lives. 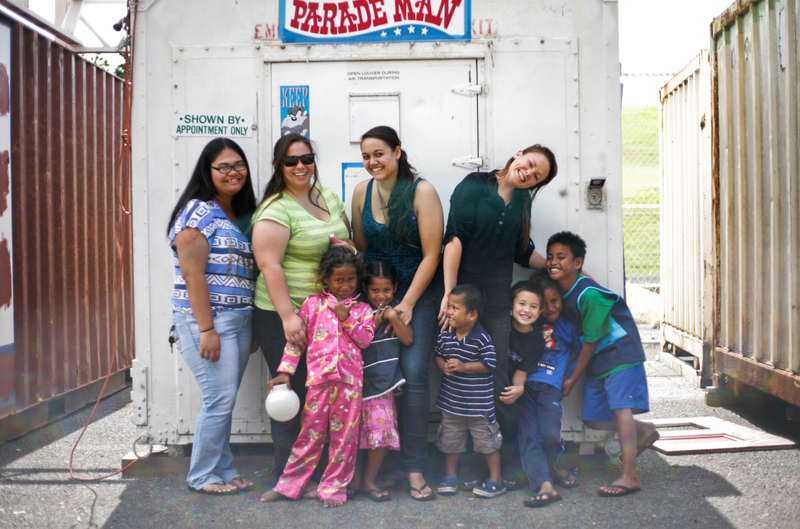 Students from my Spring 2012 FAMR course pose for a candid photograph with some children from the shelter. My oldest son (in blue) peeks out with a wide grin. As I reflect on some of the experiences we shared with those children, I am bubbling with the anticipation of getting this Kickstarter funded. I’m really not sure how it will turn out — whether the piece will be effective in communicating my heart’s desire to bring the world of photo, public health, and law for positive social change. I used to wonder if I could ever bring these areas together, and I really do believe this is a good first step in the right direction. I’m really touched by the fact that my former students who volunteered during that summer are now reaching out again to help with this project. There will be plenty of opportunities to get involved, and I’m looking forward to getting back to my roots. For now, I’m just keeping my fingers crossed and watching that pledge number rise. Who knows what the future has in store. All I know is, I intend to help and I hope people can see that. 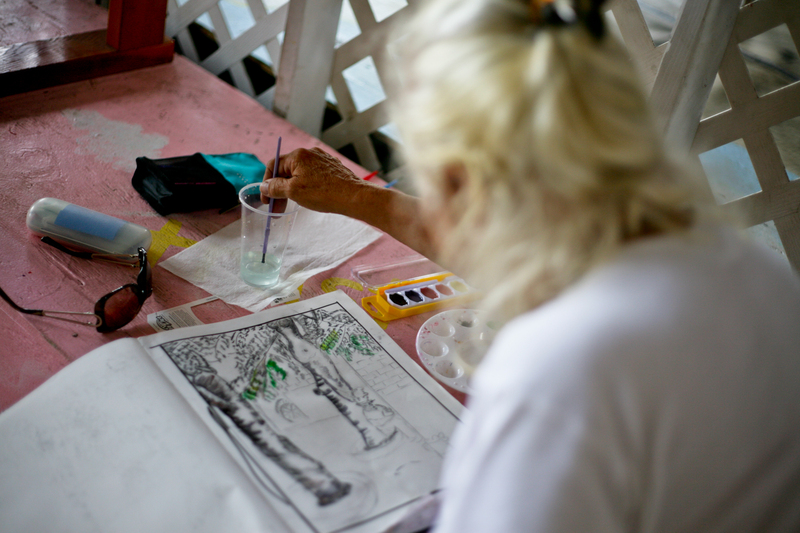 A woman who lives at the shelter uses donated watercolor supplies to create a piece of art. Thank you for sharing your amazing story! Perseverance coupled with love. I’m truly blown away by your father’s transformation. Again, thank you!